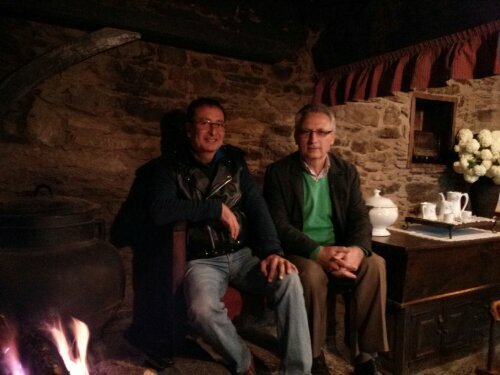 Wynette: Last night, we were sitting by the fire in our B&B (see Charlie’s post about Casa Brandariz below). We had our wet shoes there, hoping to dry them out a little. Two men sat down across from us. One was from Madrid (on right in above photo) and the other (on left) was from Argentina, currently living in the Canary Islands. They asked if we were pilgrims. They clearly weren’t (dressed too nicely) but the Madrileño said he’d done the Camino a few years ago and had written a book about it. We chatted a bit (I got to practice my Spanish) and then the Madrileño left. A bit later he returned and to our surprise handed us a copy of his book as a gift. He said he had it in his car. The book is called Ecos del Camino. His name is Manuel Fuentes. From the fly of the book I learned he is a law professor. It is a beautiful book and I look forward to reading it. It will take a while but doing that will help me learn Spanish. So far, I’ve read Camino accounts by at least seven Americans and one German. I am looking forward to reading about the Camino from the perspective of a Spaniard. He signed it for us. He addressed us as dos peregrinos americanos. 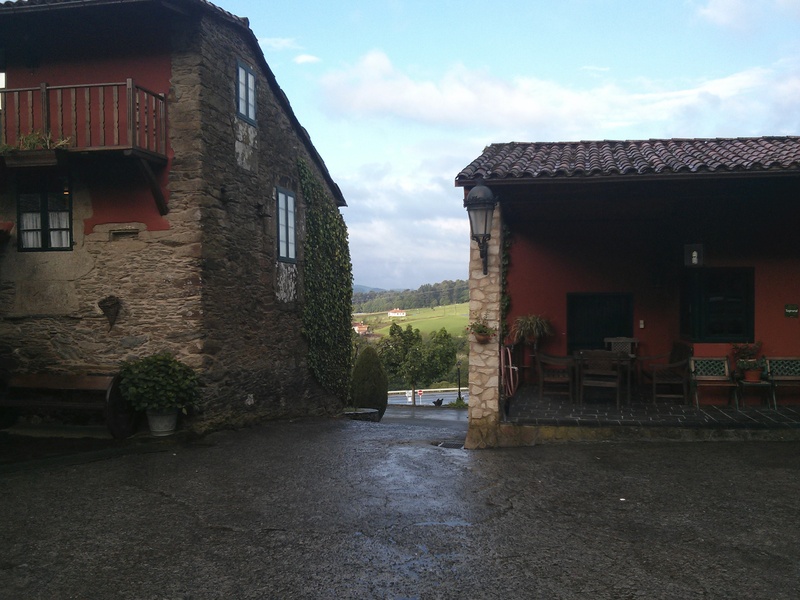 Note: Photo below is outside Casa Brandariz, taken the next morning, after the rain had stopped. What a nice experience at the end of a long journey. © 2019 Camino 2013. All rights reserved.